Of course everyone wishes the best for everyone. What if it is only the second or third marriage in let’s say three decades, is a gift really necessary if the invitation does not state ‘no gifts’ if you have already attended one or more wedding for this person? Then what about the destination wedding? Take your vacation time and money to share in the ceremony at a favorite spot of the newlyweds, most likely some place exotic. If you don’t make it to the destination, there usually is another reception for everyone who did not attend. Do you have to go to both? Is that 2 Gifts? I have a friend who does not send a gift until after a year of marriage. She has been burned too many times with the marriage being called off or ending in months. She does not differentiate between the first and the sixth wedding; everyone gets a gift after a year unless they state ‘no gifts’. This same generous person draws the line to donations in the happy couple’s name to their designated charity. She has her own favorite charities that she gives donations and that’s where her gift in the happy couple’s name goes. This August I have a wedding for a friend. It is her fourth wedding. She doesn’t count one because it was over in months, but I was there, and to the bridal shower too! I tried to reason with her, pleading that she doesn’t need gifts. Her answer like many brides and grooms is that it is a fresh start with this person to their new life together. She sold her house, he sold his, and together they bought a new home that they are just setting up, blah, blah, blah. I know I sound cynical, but we all would like new towels and kitchen ware every decade, but make your friends buy them for you again! This August I have a wedding for a friend’s son. It is his second, but the bride’s first, so of course gifts are expected. This same friend is making a 60th wedding anniversary party for her parents the same week-end. They are moving into a retirement community. The invitation did not say ‘No Gifts”. I like this friend, I like her son and I like her parents. I have known them for over 25 years and wish them all well. It is going to be an expensive August. What are your thoughts on the Wedding Season?????? Send Help, Send Ideas, Please! 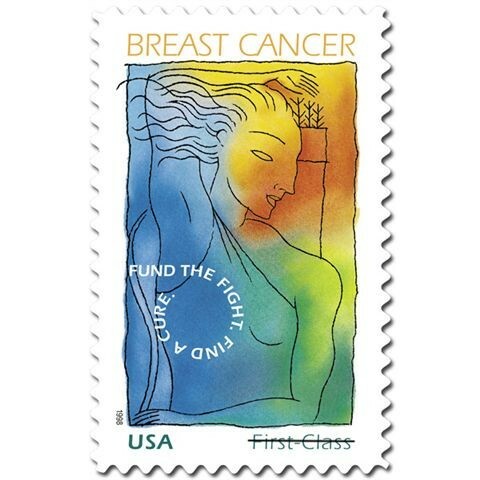 The Breast Cancer stamp turns 10 on July 29th 2008. The stamp has raised 62.5 MILLION dollars for breast cancer research, from the sale of 823.7 MILLION stamps. In 1998 when the stamp was first issued, it cost .41. Now it is .51. The stamp was designed by Ethel Kessler, a survivor herself. The illustration was by Whitney Sherman. The design is of the mythical Goddess Diana. She is shown pulling an arrow out of her quiver. Diana is the Goddess of the hunt, a symbol of strength and independence, or a symbol of a warrior against peril. Don’t you love her? The colors of the stamp are to represent the colors of all the people the disease touches. The slogan “Fund the Fight, Find a Cure”, flows clockwise in a circle where Diana’s right breast would be. What a great and easy way to help a great cause. An extra few cents every time you send a piece of mail may help some one dear to you. Pharmacogenomics is the study of inherited variations in genes that can influence a person’s response to a drug. What this means is that more individualized treatments can be prescribed. Effectiveness can be forecasted as well as harmful treatments avoided. Studies and trials around the world are being researched. The goal is to be able to read a patient’s genes and know in advance the course of treatment that will work best for that person. Just last week the FDA approved a genetic test for determining whether patients with breast cancer are “good” candidates for treatment with the drug Herceptin. “Good” in this situation means the breast cancer tumor shows it will respond favorably to the drug. Just think; you could plan for your side effects of a treatment. You could make an intelligent decision whether to consent to a course of treatment knowing the side effects may be challenging. You could plan your life as a chronic cancer patient, acute, or terminal. I know I was shocked when I went through chemotherapy to find out that the drugs they used on me were hoped to be the right ones for my cancer. I was naïve enough to think there was a formula that worked, and if it didn’t, another formula of drugs and treatments was used. I remember saying to my radiation oncologist that 12 years of medical school should have given her more than a statistical recommendation of what would work for me. She told me that actually she was a surgeon before she went into radiation oncology and had more than 12 years of medical school! Sign me up for Pharmacogenomics. It is a reality, and a new beginning in cancer I hope to see in my life time. I have grown Blueberries for 20 years. For the month of July, if I am unavailable, I am out in my patch of 12 bushes, picking, worrying and scaring off birds from my berries. Last year my yield was about 50 pounds. This is not an easy achievement. The birds love blueberries. I grow them organically. I net my bushes, I hang reflective tape, and I fly a huge flag all to deter the birds. It looks like a bad 1980’s disco scene. Each July it is ‘game on’, Haralee versus the Birds. 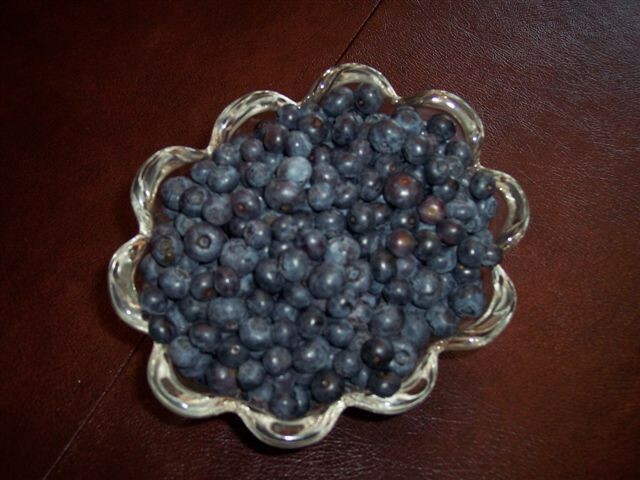 Blueberries have been singled out as a champion antioxidant. Antioxidants are substances that may protect cells from damage caused by free radicals. These free radicals may lead to cancer. We do not want to set these radicals free. Cancer in birds is not something heard often. Are the birds on to something with their voracious consumption of blueberries and subsequently acquiring lots of antioxidants? Don’t know the answer to that, but I think this is the year when the berries will be mine, all mine! From a few blogs ago I wrote about the Speedo LZR, take a look at Darra Torres. At 41, she will be at her 5th Olympic Games and the oldest member of the US Women’s Swim Team. Go for it! You are sitting around the pool or on the beach and just want to deepen the escape, the relaxation, and out pops a couple of books about breast cancer. Sit back and hear me out. ‘Middle Place ’by Kelly Corrigan is a terrific read. It is a memoir. It is touching, funny and but not really very trashy, sorry Kelly. It would make an excellent discussion for book clubs. Yes it talks about breast cancer but also about families and relationships and being a mother, a daughter, a sister and a wife. I have bought this book as a gift not just for other breast cancer survivors but for those also touched by cancer in a parent, as well as just a nice gift. This is the book for summer reading. My second choice is ‘Cancer Vixen’ by Marisa Acocella Marchetto. This is comic book style, very hip graphic novel. It is a memoir of triumph over blundering mistakes and happy endings. Marisa is so honest about her journey with breast cancer that she makes you laugh at her, and with her. If you have never read a book like this, now is the time. You’ll roll your eyes at her follies and want to hug her with her successes. So pack one of these books or both and enjoy a lazy day of summer reading.